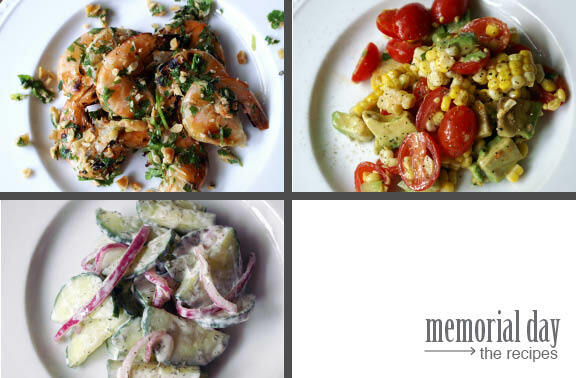 As promised, here are some of the recipes from Memorial Day, all of which we thoroughly enjoyed. None of them requires much in the way of ingredient-purchasing or time committment, which is great when you’re putting things together on a lazy weekend. There’s a few strategies I employ for weekends like this past one, where I want to relax and not spend my entire day in the kitchen; I know some of us really enjoy hunkering down into a flurry of cooking and baking, but during the warmer months, I find myself wanting to do other things as well. It’s important to never feel trapped in the kitchen while everyone else is kicking back outside, and these tips will help you do just that. 1. Keep it simple. As I said last post, high-maintenance food may be perfect for the winter holidays, but has no place in a casual summer setting. Hot weather brings so much in the way of fresh produce; why not take advantage of that? There’s often nothing better than a few fruits tossed together into a salad, or simply dressed fresh vegetables to go with whatever you’re having as a main dish. Don’t go overboard; take the rest that nature has provided you and let it do the work. 2. Too many ingredients = overkill. Listen; we all like to throw extra whatnots in our whoozit, you know? It’s natural, and sometimes it can be really great. However, overdoing summer dishes can mean disaster, because you cover up the goodness you’re serving with too strong a sauce, too heavy a dressing, etc. Try and limit things to a few fresh ingredients, a wee bit of fat, a wee bit of acid, maybe a fresh herb, and a little bit of salt and pepper. For desserts, keep the flavor profiles uncomplicated, really think about the sugar you need to add to counter the fresh fruit (because it can vary wildly depending on the sweetness), and no matter what, go with light versus heavy. 3. Make your sauces ahead. I can’t say this enough, because I find that the sauces and dressings for summer recipes take the longest (in relative terms) to make. You can make almost any sauce or dressing ahead, and it saves precious minutes when you’re trying to get everything to the table at the same time. Additionally, it gives the flavors time to blend, so your food will taste even better than it already does. Invest in some smaller Tupperware so you can whisk together your dressings in advance and store them with ease. 4. Ditto for chopping. If you’re making simple food and going heavy on the fresh produce, there’s going to be some slicing and dicing. You can’t do that 100% of the time (avocados, apples, pears) but you can do it safely with most fruits, vegetables, and fresh herbs. Look at your party plan and see what can be chopped ahead and stored until service; chopping doesn’t take long either, but why not have it finished ahead of time? 5. Don’t try to do everything at once (unless you want to). When I say to do things ahead of time, I’m not telling you to swap out big chunk of your day in the kitchen for another; space it out! Especially for summer holidays, when we’re busy doing other things inside and out, I spend a few minutes in the kitchen at a time, as activities permit. Each dish takes a few minutes prep, so if there’s a break in the action and i feel like chopping or whisking, I do it, and boom: one more dish ready to go. It helps to keep a (paper!) checklist out in so you remember what you could work on if you feel like it. Before you know it, everything is finished and you don’t feel like you did a thing. 6. Get everyone involved. I practice this regularly, as I have an almost 3-year old who now thinks that cooking and baking is right up there with watercoloring and dollhouses, but sometimes guests like to be included too. If you’re making simple things, they can help no matter what their skill level. My mom likes to help because she’s very good in the kitchen; my sister because she learns visually and likes easy meals to throw together, and the Wee One because she can’t resist a giant spoon and a mixing bowl. Besides, having a chat over some bowls and a cutting board is very fifties and sixties, and i sort of love that. it’s a nice break from the rush. 7. Make leftovers un-leftoverlike. Generally speaking, fresh things like this tend to disintegrate after an hour or so, and you’d hate to dress a giant thing of cucumber salad only to be sad the next day because it’s mushy, right? If you employ the whole “make ahead and refrigerate” technique, it means when it’s time to serve your guests, you can only mix together what you think you need, keeping some of the food in prep stage. If your guests are staying for the weekend or you’re just wanting your leftovers to be as delicious as they were the day of, keeping things in a holding pattern to put together when you’re ready to eat them means a longer life for all of your food, and no waste. This is also perfect if you’re attending multiple parties, because no one will know you made a double batch of something and are bringing what is essentially your leftovers to the second/third event of the weekend. 8. Have no shame in your store-bought game. I, yes, talk about how much I love homemade versions of things versus their store-bought counterparts, but when it comes to parties, I like to supplement my dishes with a little help from the local grocery. It’s never a bad idea to serve potato chips from a bag; who wants to mess with hot oil in their kitchen on a 90 degree day anyway? No one. Make a nice dip to go along with them or something. Same with buns for hamburgers and hotdogs; we have so many fine purveyors of artisan breads around here that it would be a shame not to purchase them. I have a tendency to say borderline insane things like “wouldn’t it be easier to just make buns for the burgers, so we could tailor them to optimal size…?” which is sheer lunacy. No it would not. Resist the urge to fill in all the time you’re saving with other things to do. And now; the recipes. You can find all of the original recipes pinned on my Pinterest page on the board “holiday = summer,” but I do think they’re all my girl Martha Stewart‘s recipes. I love her in the summer; she really does it right. I’m saving the galette recipe for its own post, because I think they deserve it. It’s the only sweet offering here, so it seems appropriate. Before anything, slice the onions – as many as you’ll need – and throw them in a bowl of ice water; it takes the sharpness off of them so it doesn’t pervade the dish too much. Set aside. Whisk together the sour cream, lemon juice, and fresh dill. Season with salt and pepper to taste, and let sit for at least 1 hour to allow flavors to blend. When it’s time to serve, Chop cucumbers in half lengthwise and then into sections maybe 1/4-inch to 1/2 inch thick and toss in a large bowl. Add as many onion slices as you see fit, and add your dressing, a spoonful at a time, mixing gently until everything is incorporated. Don’t push to add all the dressing here: I often don’t use the entire amount, which is great because you can save it for a second cucumber salad. Season again with salt and pepper to taste, and serve immediately. And feel free to grill it, also, but I like the plumpness you get from boiling it for this dish. Set a large pot of water on the stove (enough to cover your corn) and add granulated sugar; stir. Bring to a boil, add the ears of corn, and bring to a boil again. Let boil for maybe a minute or so, then remove the corn from the water and transfer to a plate to cool. Using a sharp knife, hold the corn vertically and cut the corn kernels from the cob. When it’s time to serve, add the halved tomatoes, scallions, and corn to a bowl. Slice the avocado and add to the bowl. Squeeze the limes over top, add the oil, and season with salt and pepper. Serve immediately. note: you’ll need big skewers for this. I have the metal kind, which are cheap and reusable. If you have the wooden sort, make sure to soak them in water at least an hour or so before you grill your shrimp. Zest the limes into a large bowl, and juice 2 of those limes. Add the fish sauce and sugar and whisk together. Set aside. Layer the cilantro, peanuts, and scallions in an appropriately sized container; I like to layer these versus mixing them together ahead of time because it keeps the flavors distinct, and helps the peanuts avoid the moisture from the other ingredients. Set aside. When it’s time to grill, place your shrimp on skewers and well…grill. You’ll want to watch these carefully, as they only take about 2-3 minutes per side; they are finished when they’re pink and fairly firm to the touch. As soon as they come off the grill, use a pair of tongs and slide the shrimp into the bowl with the lime mixture in it. Toss a few times to coat, add the cilantro/peanut/scallion layers, and toss again until evenly coated in herby peanut deliciousness. Transfer the shrimp to a serving tray using a large serving spoon, then throw the leftover herb-peanut mix over top. Serve immediately. 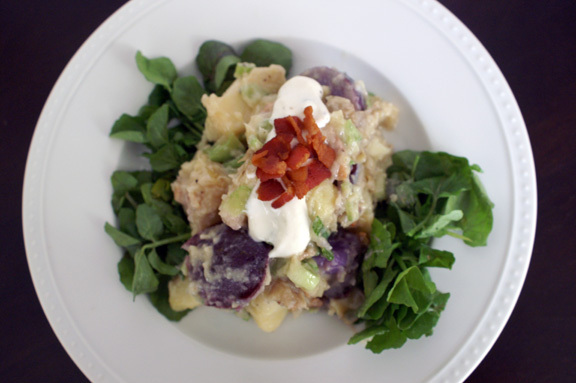 smoked potato salad + horseradish cream. 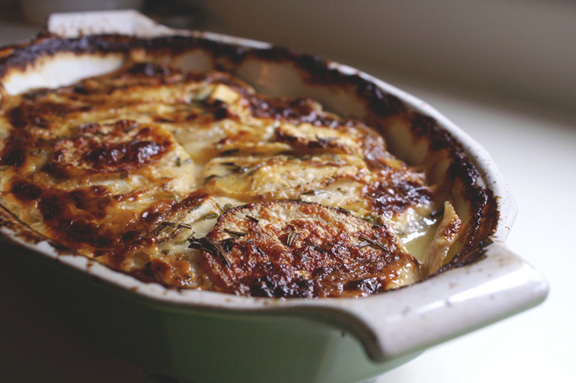 celeriac-turnip gratin with herbed maple cream. totally making ALL OF THESE (except the shrimp one, I’m not a shrimp-eater). the poor, oft-maligned shrimp. 🙂 i can accept that; this little saucy-sauce thing would taste excellent if you did, say, grilled halibut or another firm white fish as well. i think creamy ones are often heavy as well. and you are SO RIGHT ABOUT YOGURT most of the time: i get that some people don’t eat sour cream, and if you’re not used to the goodness that IS sour cream, yogurt is probably a perfectly fine substitute b/c your taste buds wouldn’t miss it. but there’s no denying the tang you get from actual sour cream in things like this. dressings = i never substitute. cakes = maybe, b/c once you bake it there’s not much difference. HA i love how charcuterie is so in right now and really, my mom has been doing “charcuterie” for years; she had no idea how fancy she was! Half-pint canning jars (or pint size, depending on the size of your recipe) are great for making and storing salad dressing. Just toss all the ingredients in, cap it tightly, and shake thoroughly. If you’re taking them on picnics, you do have to be a bit careful with the glass, but they’re fairly sturdy and leak-free! The corn, tomato and avocado salad looks simply delicious! Melissa, i wholeheartedly agree! i buy Ball jars in smaller sizes all the time, collect them from thrift stores, and save the pretty Bonne Maman jelly jars when i use all the jelly; so great for storing dressings, fruit sauces, everything! And the flavors don’t leach into them like they tend to with plastic, which is also great. thanks! 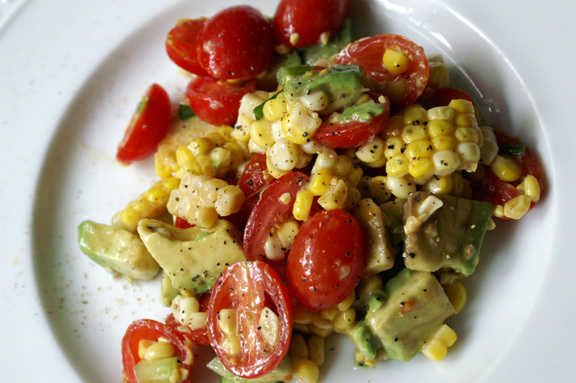 Oh boy, I absolutely *must* make that corn, tomato, avocado salad. Pinning right now so I don’t forget. I hope you had a great holiday weekend. The food looks just scrumptious! it’s SO good, monica: it sneaks up on you, because you look at it and it’s so incredibly simple that you don’t expect all the flavor you actually get from it. I’ll be eating this all summer. Hi Shannon – I made the salad already and it is delicious!! I had to use a splash of lemon because I didn’t realize it called for lime (makes so much sense!) and despite tons of limes staring me in the face when I shopped, I didn’t get any! I went light with the lemon so it’s fine but next time, I’ll be sure to have limes! your salad sounds amazing! 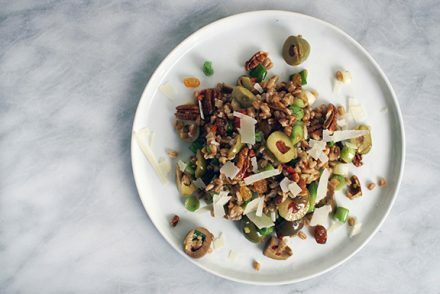 Now it’s my turn to try a recipe…love summer salads like that. do you have the same issues i do with extra scallions? always sad when you buy a bunch of them and they go bad, because they’re so delicious. you are so welcome – thanks for trying it! YUM. I’m especially craving those shrimp – so yummy! those shrimp were a personal favorite, and so intensely easy. I said this in another comment, but the sauce/herb mix would be great on almost any white fish, too. really light but so flavorful. Love your philosophy and trade secrets! I definitely botched things this weekend by trying to get too much to-do done and not relaxing enough. I won’t make that mistake again (at least this summer)! summer is for relaxing with food. period. i tend to want to overdo things too, which is why i was glad that my voice-of-reason sister was here to sort of talk me down and give me the side eyes when i said things like “how about we could make our own bbq-spice-dusted sweet potato chips? THAT WOULD BE SO EASY!” 🙂 i think overdoing it means you just love food, and that’s never a bad thing. I’m all over that corn, tomato and avocado salad! Ceeeee-laaaaaan-trooooooo. Can’t get past it. Nor do I really want to. they should actually consider spelling cilantro like that. Those shrimp! Ooooh, those shrimp! Fantastic. agree re: shrimp. SOOOOO tasty. I refuse to eat anything but grilled or otherwise naked shrimp (I think frying shrimp hurts their feelings and my own) so this was pretty perfect in terms of adding some nice flavor and crunch. martha has some really good ones; she does a nice tomato-heavy salad also every year, because she’s one with the heirlooms (i’m pretty sure all the heirlooms in the world grown in her massive backyard). I just did a little magazine archive research here and found several versions of corn salads in her back issues, each one a little different. that woman sticks to a theme from year to year; i’ll give her that. Lots of great info and I love all the dishes! 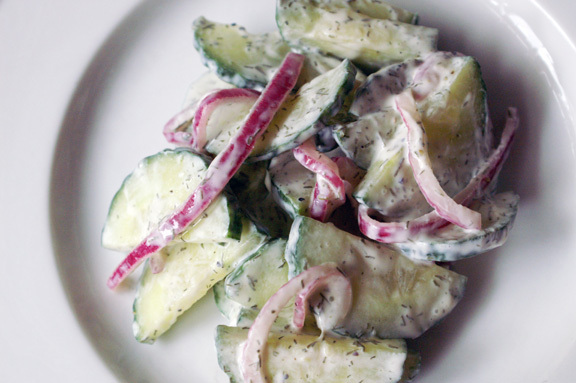 Have a cuke in my fridge right now and will make that one tonight to go with my leftovers! Thanks. I want to make every one of these recipes. Also, I feel like your tips for entertaining are tips to live by. I think I might have to post them on my fridge. on second thought, i’d make an EXCELLENT M-Stew. omg that IS a million degrees in American!! I feel like maybe i’ll work in your bakery during the cooler months, where the thought of sticking my face repeatedly in ovens sounds nice. In the summer, i’ll just be in charge of making you lunch salads and dessert salads.